World Flower -1 is the first level of World Flower in New Super Mario Bros. 2. This level takes place in the mountains during sunset, and the floor is mainly made up of pipes, mainly infested with Piranha Plants. Mario begins partially enclosed in a set of Snake Blocks on a blue pipe. Above is a set of three ? Blocks, of which one contains a Super Leaf. Mario will then have to jump from Snake Block to Snake Block to leap over an abyss. More Snake Blocks can be found next, also leaping over an abyss, then a Goomba can be found. An area with fast Snake Blocks follow, where Mario have to walk on the Snake Blocks quickly to the other side. The Checkpoint Flag can then be found, followed by ? Blocks which one of them has a Super Leaf. Mario will then come across an area with many Snake Blocks where he needs to make his way upwards to the other side. Two ? Blocks can be found above a single Koopa Troopa. The one on the right will begin flying when hit and hitting it again releases a 1-Up Mushroom. Mario then has to cross several gaps in between mini pipes with Snake Blocks above them. After that several Goombas can be found on more Snake Blocks, followed by the flagpole. 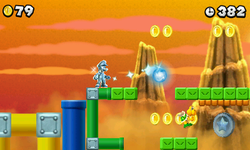 Star Coin 1: The first Star Coin can be found early in the level between two sets of Snake Blocks guarded by a Koopa Paratroopa. Mario will have to drop down to the lower half of the mini pipe on the left and slowly use the Snake Blocks to reach the Star Coin. Star Coin 2: The Star Coin is just before the checkpoint beside a mini pipe. Mario needs to wall jump off the nearby Snake Blocks when it gets close enough to reach the Star Coin. Star Coin 3: At the top of the area where Mario needs to make his way upwards after the checkpoint, there are two blue pipes on the left and a yellow one on the right. Mario should carefully slide down the side of one of these pipes to find the Star Coin and wall kick back up afterwards. When Mario reaches the two ? Blocks before the area with the Snake Blocks above the mini pipes, Mario needs to hit the right ? Block to make it fly, then stand on top of the block until it flies upwards, taking Mario to a hidden area in the sky. This is best achieved by performing a ground pound on top of the block while it is not flying. Mario then has to cross several sets of Snake Blocks, which ends with the flagpole. This exit unlocks World Flower -A. This page was last edited on April 13, 2019, at 08:53.